Scientists developed a novel technique that prevents a rare but often fatal complication during transcatheter aortic valve replacement. The technique may increase treatment options for high-risk patients who need heart valve procedures. Aortic valve stenosis is a narrowing of the valve that controls blood leaving the heart to the rest of the body. This narrowing reduces blood flow to vital organs, resulting in shortness of breath, chest pain, blackouts, and heart failure. 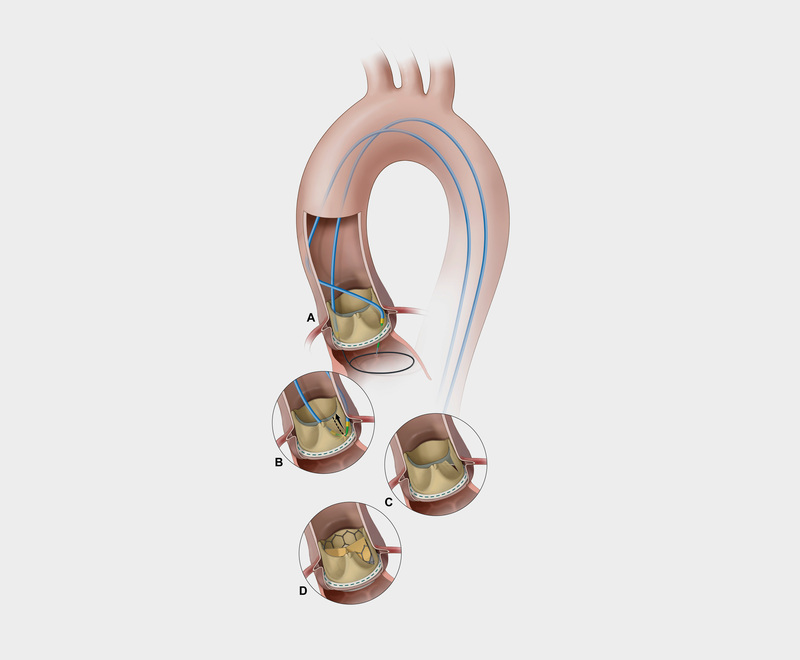 A transcatheter aortic valve replacement (TAVR) is a procedure used to treat aortic valve stenosis. It involves threading a long, thin, flexible tube, called a catheter, through the femoral artery in the leg to the heart and using a balloon to open a new valve inside the aortic valve. For older adults or frail patients, TAVR offers an effective and less invasive alternative to open heart surgery to replace the aortic valve. However, some patients have uncommonly large aortic valve leaflets, which are the parts that open and close the aortic valve. This can cause a complication during TAVR called coronary artery obstruction, where the leaflets block the replacement valve when it opens and prevent the flow of blood to the coronary arteries. This complication has been fatal within 30 days for more than half of patients. A team of scientists led by Drs. Jaffar M. Khan and Robert J. Lederman of NIH’s National, Heart, Lung, and Blood Institute (NHLBI) developed a novel technique that prevents coronary artery obstruction during TAVR. They tested the procedure in both pigs and a group of patients who were at high risk for conventional TAVR. Results were published in the Journal of the American College of Cardiology: Cardiovascular Interventions on April 9, 2018. In the BASILICA procedure, doctors use a catheter to position a snare underneath an aortic leaflet. Using another catheter, they direct a guidewire through the base of the aortic leaflet and into the snare (A). The snare is pulled back (B), and the guidewire is electrified to cut the leaflet (C). The leaflet splays after TAVR, permitting blood flow (D). Khan et al., J Am Coll Cardiol Intv. The new procedure is called Bioprosthetic Aortic Scallop Intentional Laceration to prevent Iatrogenic Coronary Artery obstruction (BASILICA). It involves a cardiologist threading an electrified wire through a catheter to split one of the aortic valve leaflets in two so it can’t block the coronary artery when the transcatheter heart valve opens. The researchers first tested and refined the procedure in pigs. They then performed the technique in seven gravely ill patients who qualified for compassionate use of the technique because no other care options were available. All the patients had a successful TAVR with no coronary obstruction, stroke, or any major complication 30 days after the procedure. BASILICA, however, may come with its own set of surgery-related risks. The technique will be further evaluated for safety in a multicenter study sponsored by NHLBI, which began enrolling patients in January. The authors speculate that the BASILICA technique may also be useful in the future to treat degenerated TAVR devices. References: Transcatheter Laceration of Aortic Leaflets to Prevent Coronary Obstruction During Transcatheter Aortic Valve Replacement: Concept to First-in-Human. Khan JM, Dvir D, Greenbaum AB, Babaliaros VC, Rogers T, Aldea G, Reisman M, Mackensen GB, Eng MHK, Paone G, Wang DD, Guyton RA, Devireddy CM, Schenke WH, Lederman RJ. JACC Cardiovasc Interv. 2018 Apr 9;11(7):677-689. doi: 10.1016/j.jcin.2018.01.247. PMID: 29622147. Funding: NIH’s National Heart, Lung, and Blood Institute (NHLBI).